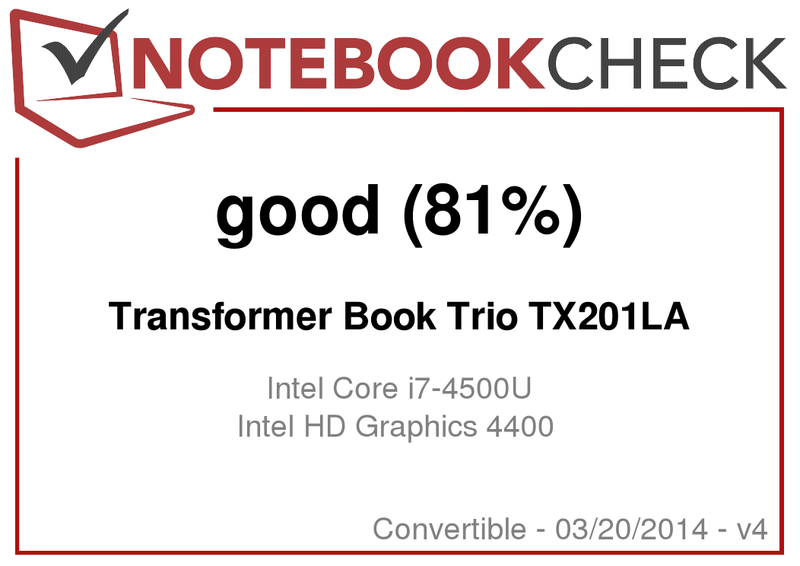 Transformer Book Trio TX201LA: <b>The</b> allrounder? 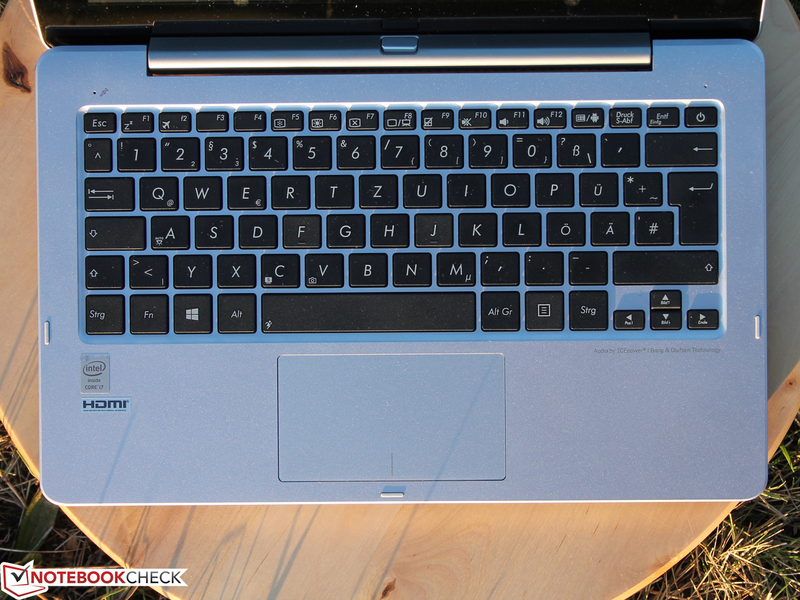 Is the Transformer Book Trio TX201LA the allrounder? The device manufacturers and Microsoft have been working hard to transfer Windows computers in the portable world of touch laptops for two years. Windows was treated to the more or less unsuccessful tile interface (that the typical user doesn't use to start with), and innumerable convertible PCs were created to tempt buyers to swap their laptop for a tablet. However, even the most expensive and technically perfect devices still have one fundamental drawback: The Android-spoiled and accustomed buyers have to browse the Internet, read or be entertained via Windows. Just this often arouses the desire for a long runtime, and cheaper Android tablet. Asus takes a daring step with the Transformer Book Trio, and solves this controversy its own way. A dedicated Android system is in the tablet, and the keyboard dock is powered by premium range subnotebook hardware (including ports). The buyer thus gets three devices in one: An Android tablet with an Intel Atom processor, a small desktop PC with Core i7, and a Windows or an Android notebook when both parts are united. Is that really more than the sum of all things? The answer can be found in our test report. Choosing contenders proved difficult. Dell's XPS 12 (Haswell) and Sony's Vaio Duo 11 SV-D1121X9EB are matching alternatives due to their similar screen size, the quality, and the price. But neither are docking tablets, which is only found in 13.3 inches (HP's Split x2). 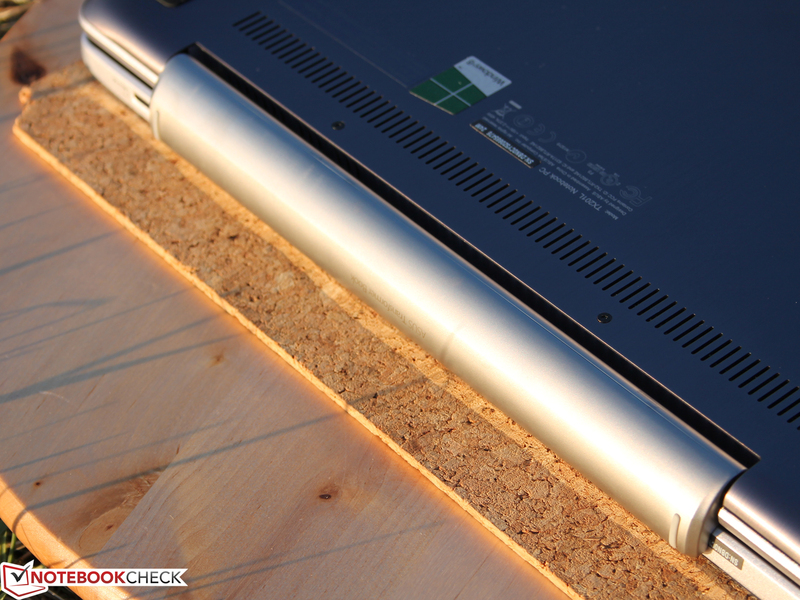 Beyond that, Lenovo's Yoga 2 Pro (360 degrees) and Asus' Taichi 21 (screen on the lid's back) would be options. The Transformer Trio is currently priced at 1000 to 1100 Euros, which is a steep price. The buyer can expect at lot for that - and also gets it. The build is beyond reproach. Both the base and the lid are made of one piece of aluminum. Although that makes the components a bit heavy (1703 grams; tablet: 714 grams), they have a very solid (extremely stiff), and high-quality feel. 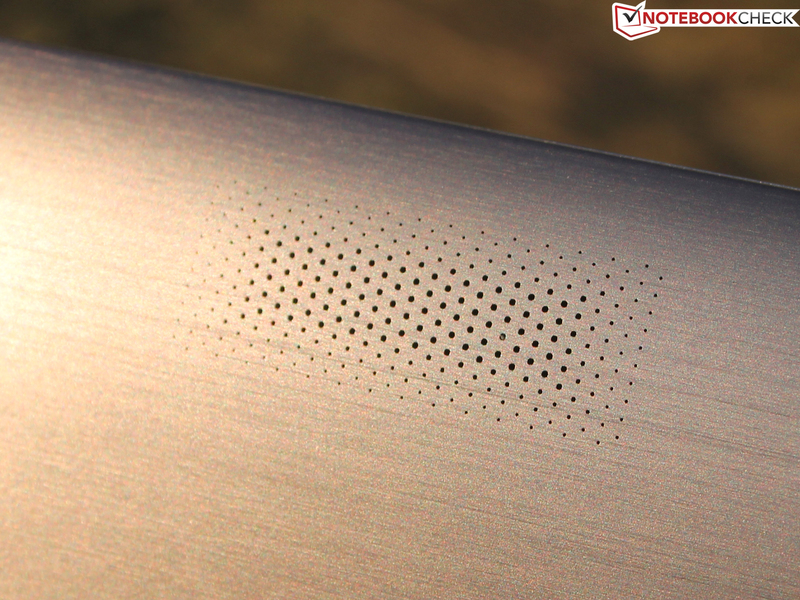 The lid and underside feature anodized, brushed aluminum, and are thus quite non-slip. The tablet's connector is completely made of metal. Unlike other keyboard docks, it does not feature a U-shape but an L design. 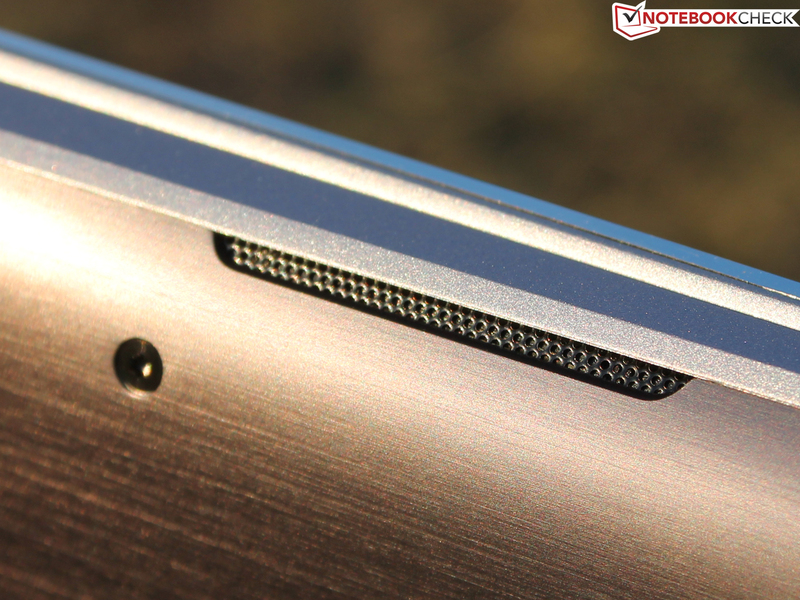 The locking pins have a very wide size to prevent the screen from wobbling too extremely. They both have a hook that can only be released via the mechanical button in the hinge's center. The hinge itself sits very tight in the axis of the base. 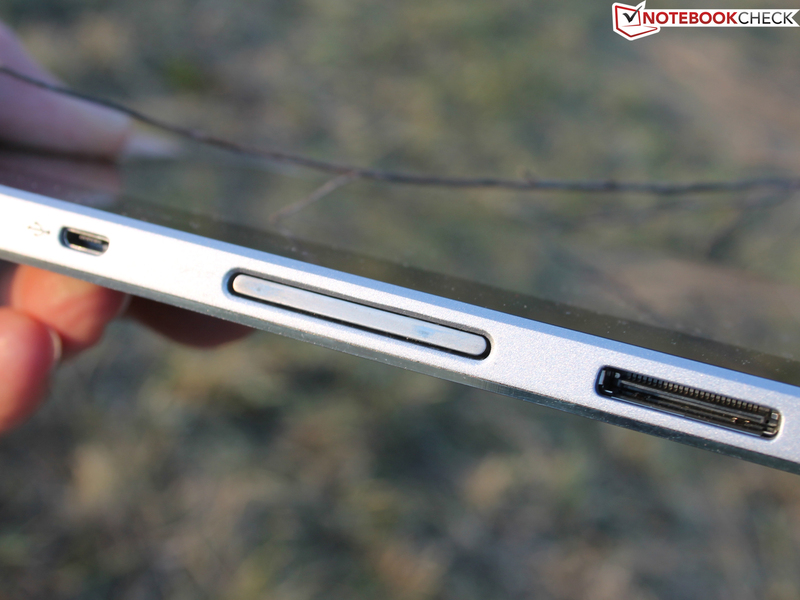 But it has to be this tight because the screen would otherwise fall back while tapping and swiping in notebook mode. Clever: The mount for both elongated pins are closed by flaps in the tablet. They open to the inside, i.e. they are pushed aside by the pins when inserted. This has a less functional than an optical benefit. 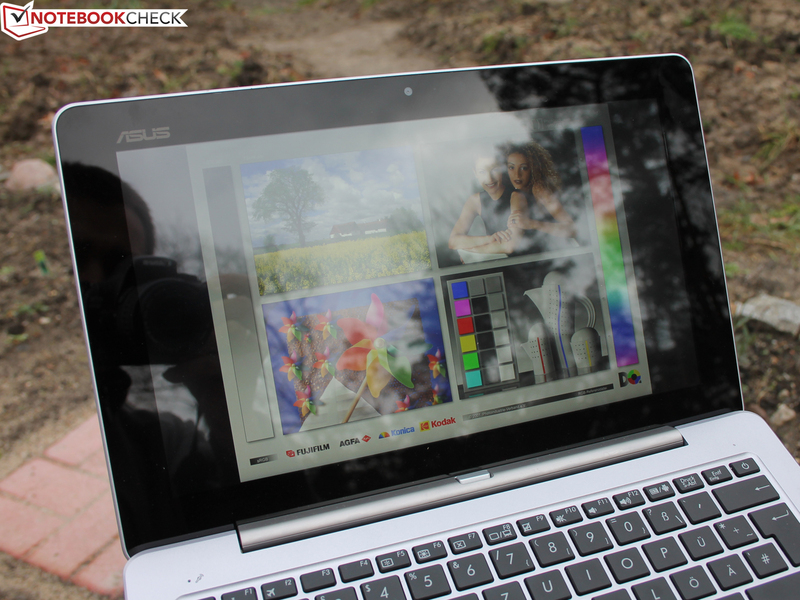 Asus uses interfaces that we would expect in a subnotebook. Two USB ports are rather scanty, but it features a mini-DisplayPort that can also be used with a VGA cord via the included adapter. The ports are located in the device's rear area, so that cables can be quickly led to the back. Ports on the rear would be ideal for a PC station (doesn't ruin the view), but the hinge makes that impossible. 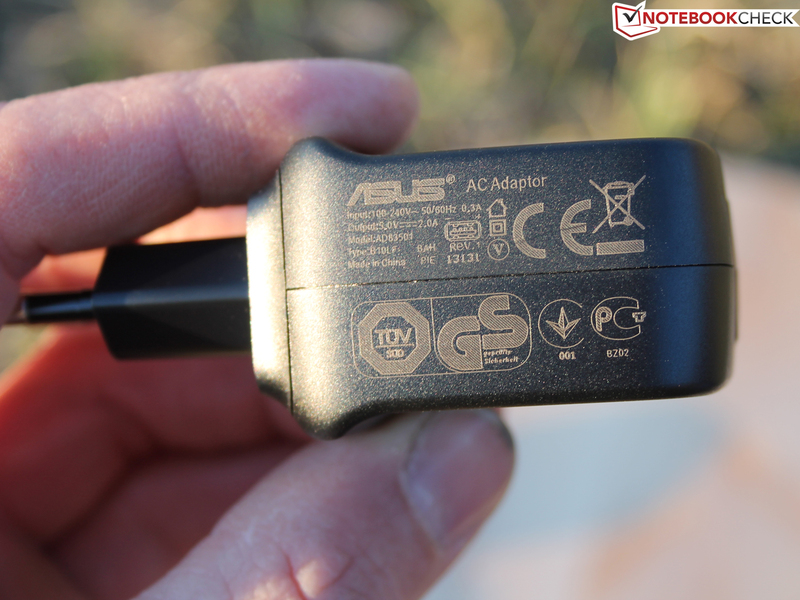 Asus installs Intel's Wireless AC 3160 Wi-Fi adapter that supports the latest ac standard. It provides gigabit speed by radio for the first time. It should make up to 3.5 GBit/s possible. The corresponding 802.11ac router is needed to actually use "Gigabit Wi-Fi". Being an AC model, the adapter can switch to the less frequented 5 GHz band. 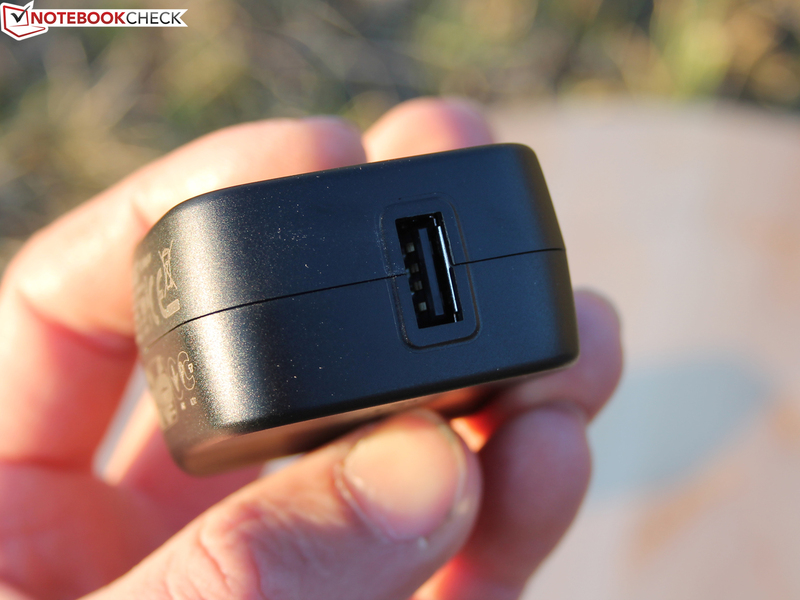 The adapter also includes Bluetooth 4.0. The Intel module exhibited strong and stable connection strengths in short and medium distances in our non-representative range test. Windows still displayed four signal bars even at the 15 meter point outside the building. The connection with the router is lost beyond that (45 meters, Fritz!Box 7270 @ 100% transmission power). This information is related to the base, so the Windows PC. 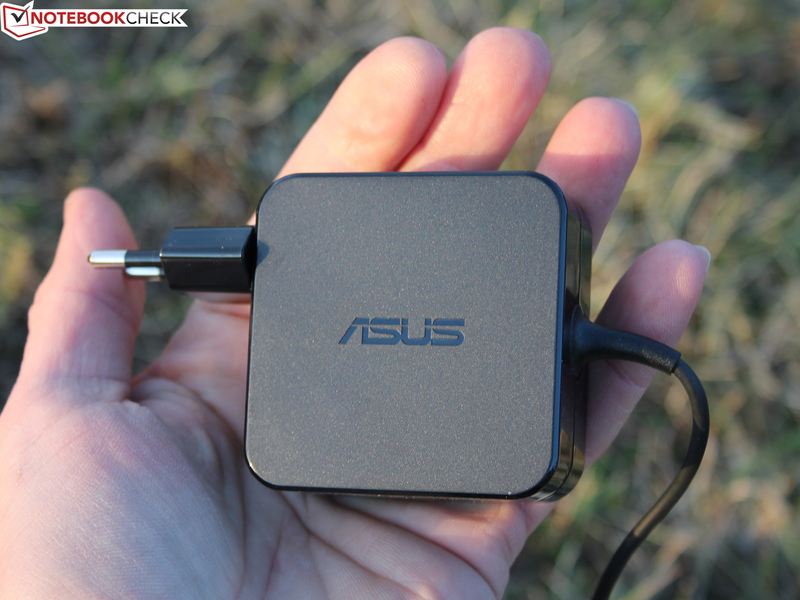 The Android tablet only sports an 802.11n, single-band adapter with Bluetooth 3.0. Asus puts two power supplies in the box. The 45 watt PSU is for both the PC station and laptop. 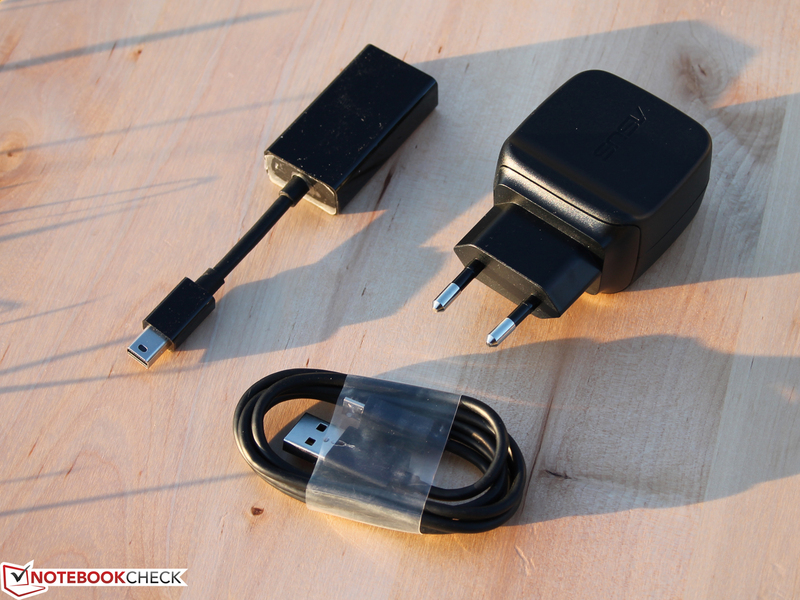 The tablet itself is powered by a smaller USB power supply (screenshot). 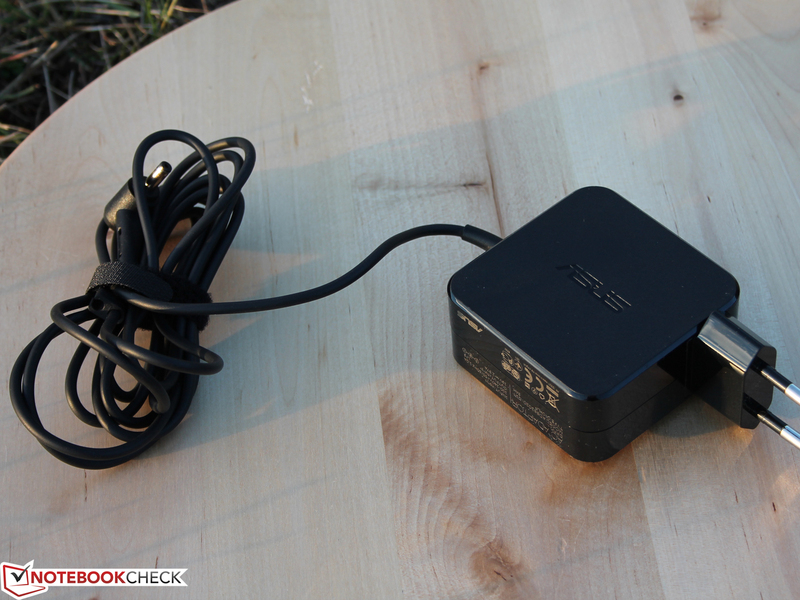 It supplies 20 watts, whereas the tablet is connected via micro-USB. A converter for the mini-DisplayPort is in the box for connecting the old d-sub VGA cord. The only other accessories are a cleaning cloth, warranty card, and a quick guide. Neither the tablet nor the dock have a maintenance cover. We could use the small Torx screwdriver on the base, and thus remove all screws (also underneath the stoppers), but we could not dislodge the aluminum plate. It is fastened directly in front of the hinge. We did not apply force out of consideration for the loaner. The 2.5 inch hard drive was recognized through the gap. 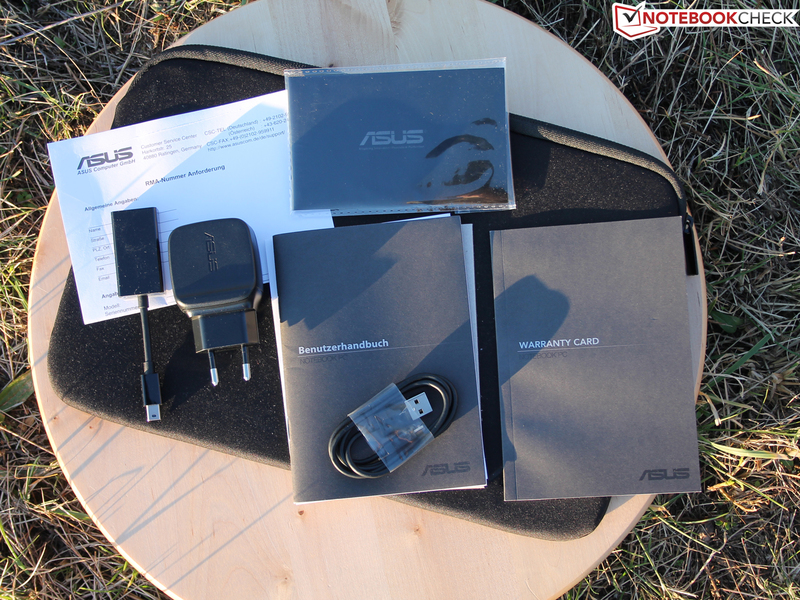 Asus includes a 24 month pick up & return manufacturer warranty. The support picks up the device after registration. 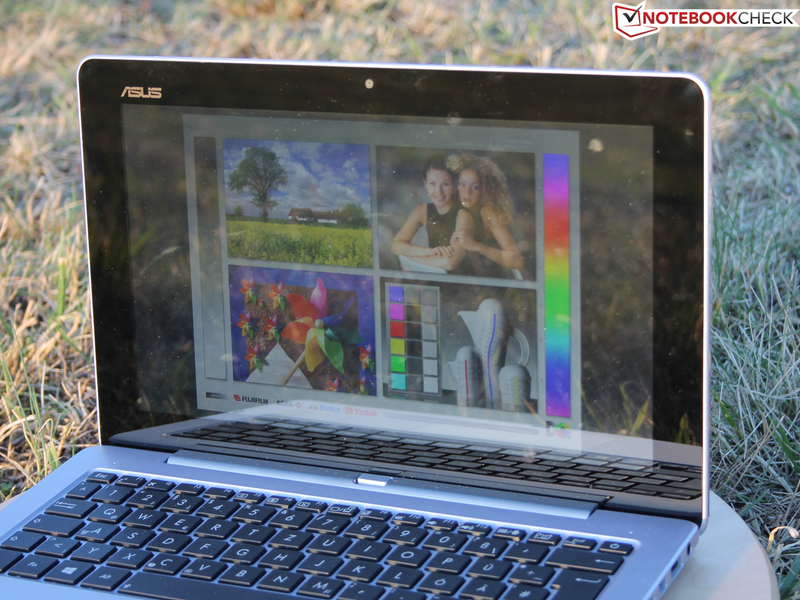 This is different for less expensive Asus device; the Transformer Book T100TA is only covered for 12 months. The warranty period can be extended by additional 12 months for 90 Euros. Both the Android Jelly Bean 4.2 and Windows 8 Pro 64 bit operating systems are installed. 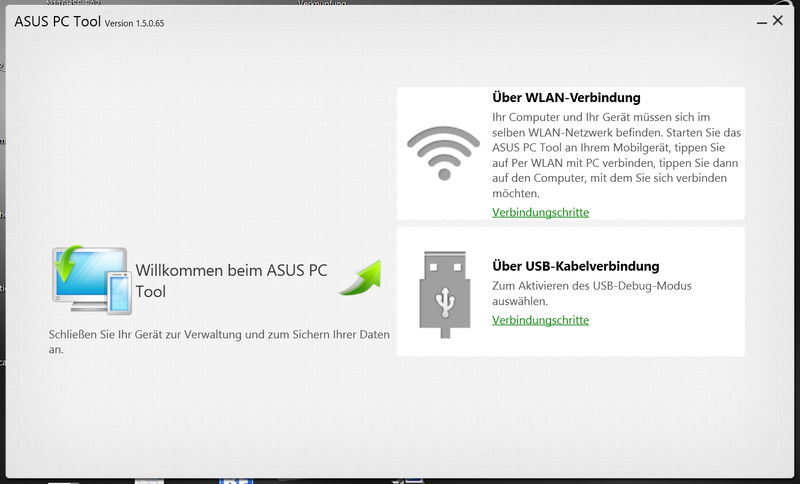 Besides that, Asus tools, such as the Console, are also pre-loaded. It provides the user with status information like how much storage is still available, and allows many useful settings around using the trio. 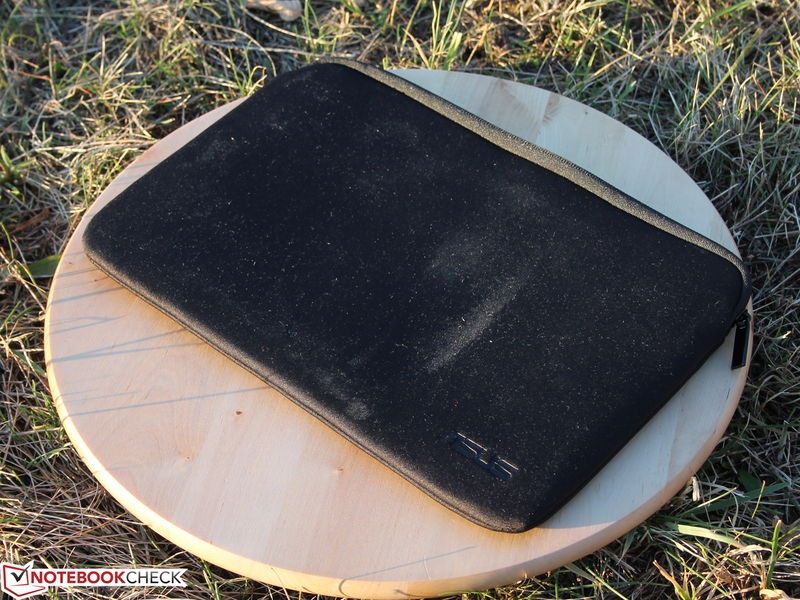 For example, the PC's base can be used as a hot spot for the Android tablet. Which files / drives are to be accessible under both Windows and Android can be set in Disk Share. Convenient: Webpage Share opens the last visited website in the other OS. 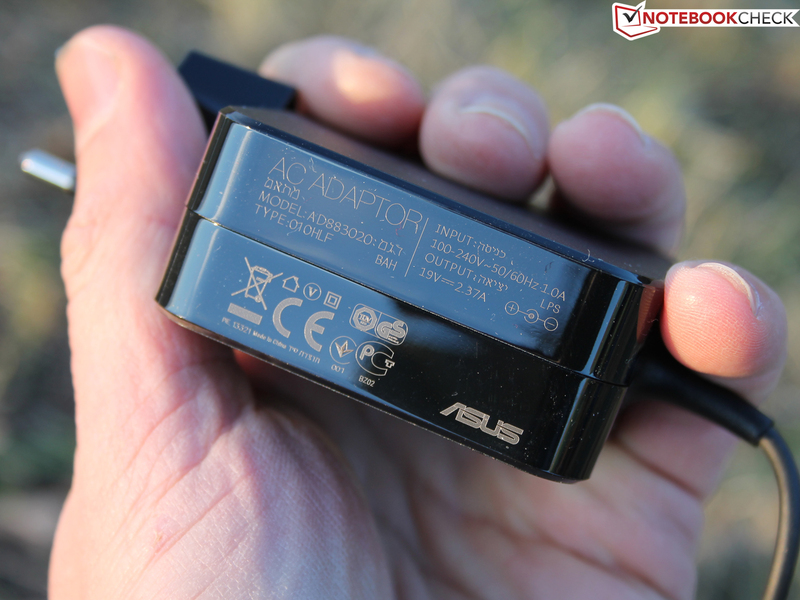 The user can determine which battery is to be used first (PC station or tablet) via Smart Charging. The Trio OS Switcher runs in the background, and switches between Windows and Android via the FN key. The inactive OS is then set to standby. The user can shut it down manually, and the other OS appears on the screen after that. Finally, a trial version of MS Office is also installed. The 5 MP camera on the back can only be used with Android. 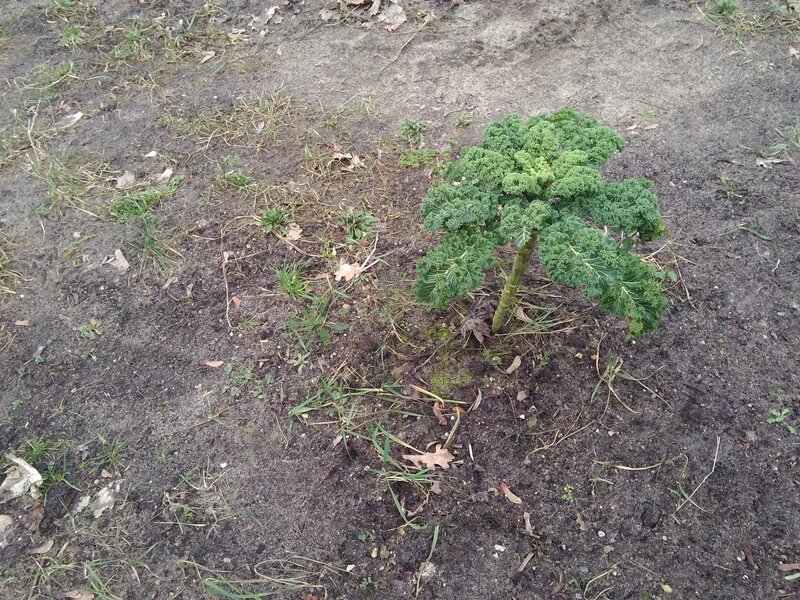 The picture quality is appropriate, and autofocus actually manages to focus the relevant objects. Naturally, it is noticed that the sharpness cannot compete with an SLR in detail when looking closer. However, since Windows can access the Android system's storage, it is quite feasible for quickly switching to Android for shooting pictures or videos. 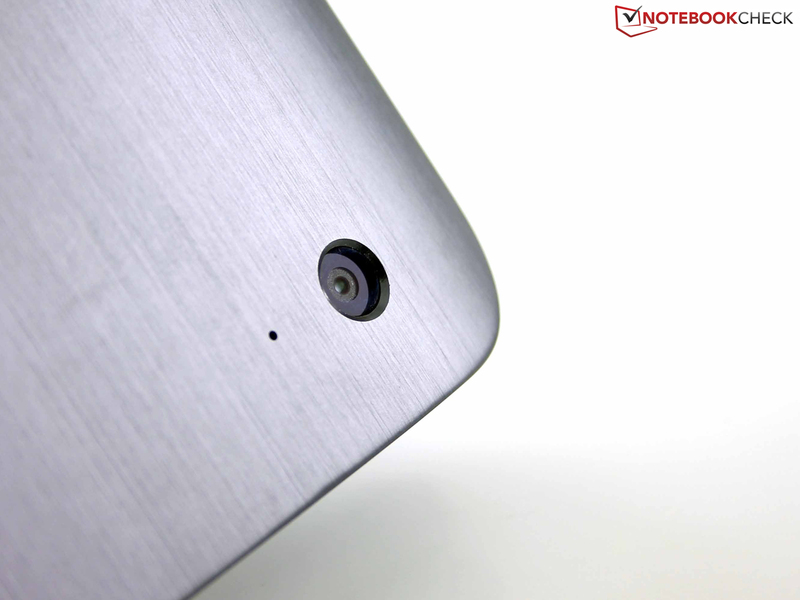 The front-facing camera not only offers the low, common HD resolution, it also suffers under very intense noise. Outlines are barely recognizable, the image looks faded. A tiny fragment of foil also blocked the view (behind the glass) in our model. We assume that it is not an epidemic failure. 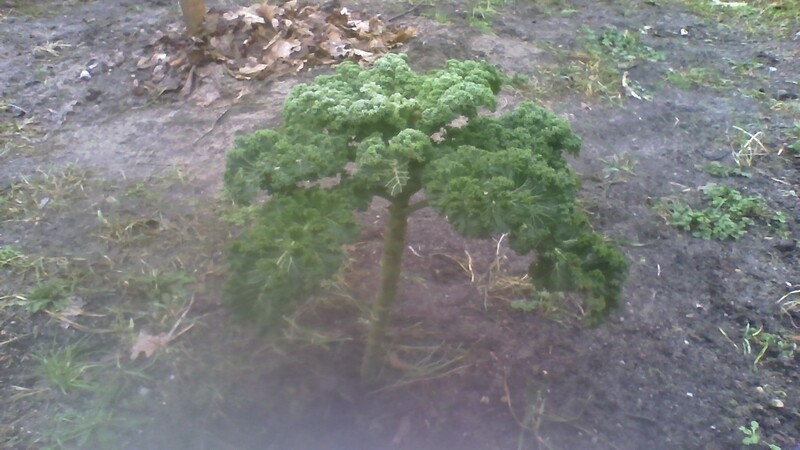 5 MP primary camera, Android only! 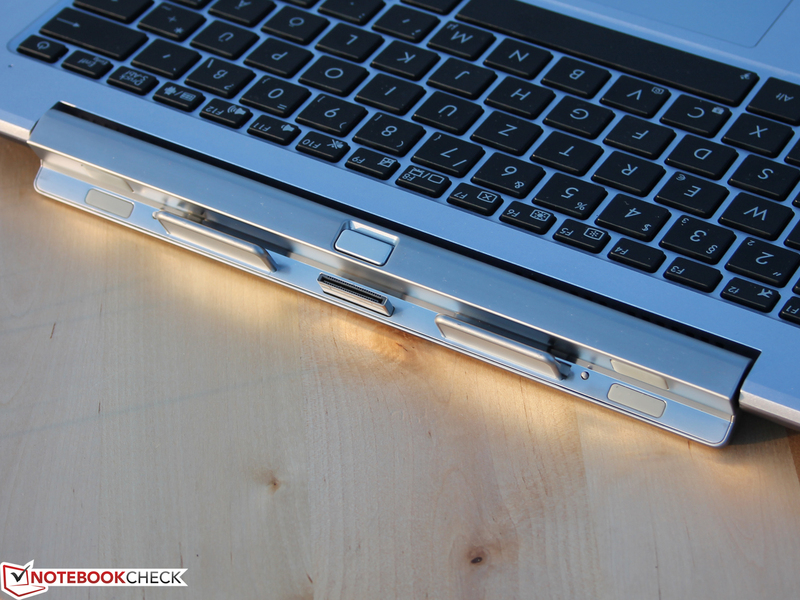 The backlit keyboard in the Transformer features a clear key drop, a firm but not hard stroke, and a crisp pressure point. The keys supply the hands with fairly good feedback when typing. The key area fits tight all over, and the arrow keys are separated. 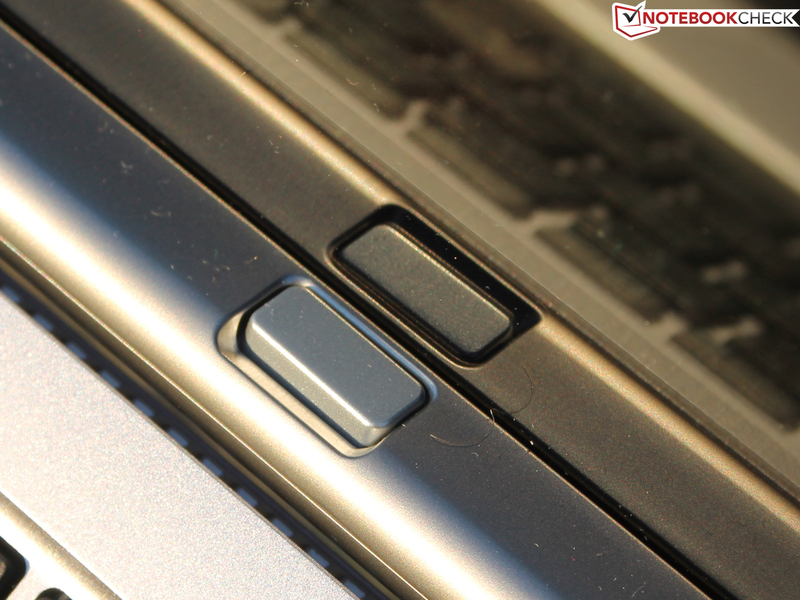 The keys are in a distinct recess, which protects the tablet when lying on it, and makes typing more pleasant. The wrist rest's size is sufficient even for larger hands. 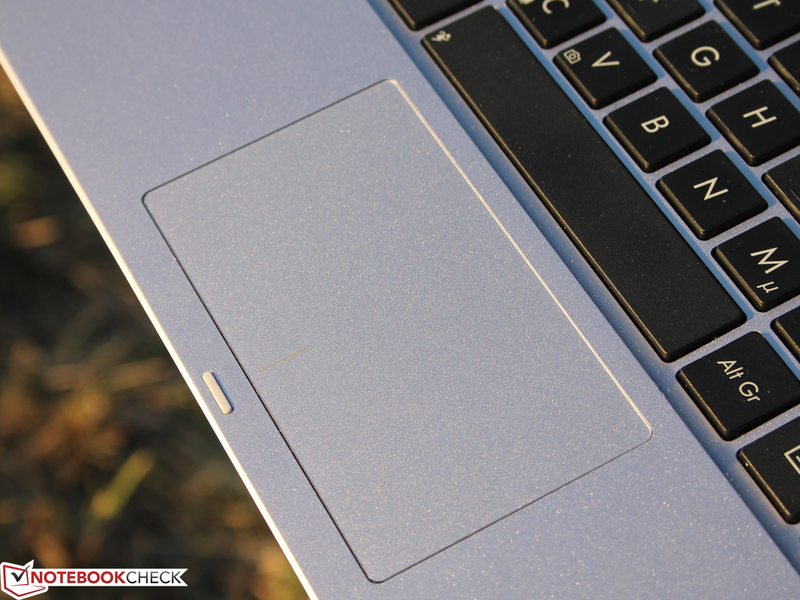 Although the ClickPad has the same color as the encompassing wrist rest, it is much sleeker than the area (blunt, non-slip). Thus, it can be located with closed eyes although it is even with the surrounding area. The drop in the lower field is sufficient, but the pad's click noise is unfortunately very loud and dull. Its pressure point and feedback are clear. The 10 finger multi-touchscreen is quick in response and smooth in use up to its edges. One finger can be swiped along the black rim, and always triggers an action (e.g. moves a window). Even higher pressure does not cause any irregularities (Touch Mura-Free). The FHD screen (1920 x 1080 pixels; 199 ppi) comes from AUO, and is the same screen as in Medion's Akoya P2211T, which is also an 11.6 incher, according to the model number B116HAN03. 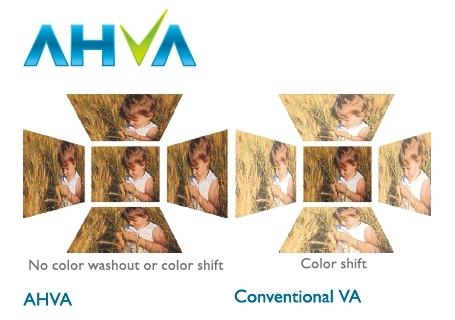 Consequently, its brightness, contrast, and color assessments are virtually identical within the tolerance zone. AUO specifies a brightness of 350 cd/m², and a contrast of 800:1 (glare model). We measured 360 cd/m² in the center, and an average of 331 cd/m². 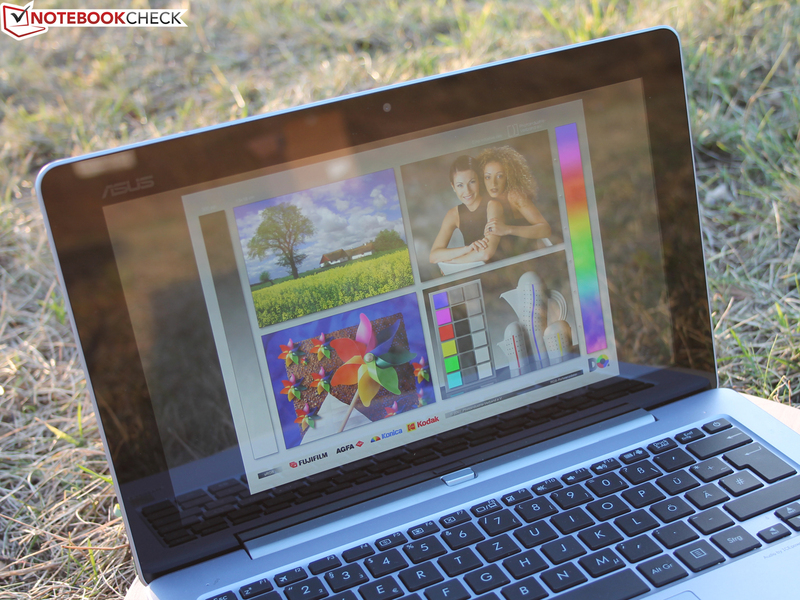 The contenders also achieve this; the screen in the Vaio Duo 11 is the brightest with 417 cd/m². The contrast of 720:1 deviates slightly from the specifications. Contenders, such as Dell's XPS 12 or the Taichi 21 are better here. 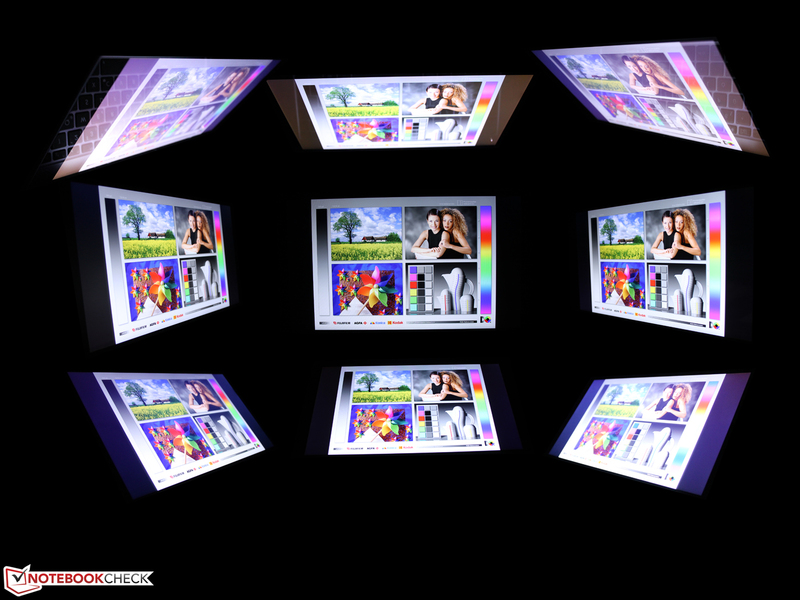 The screen's illumination of 86% is still homogeneous enough; the "darkest" area on the screen still measured 311 cd/m². We did not ascertain bleeding at the edges. The Trio does not cover either the sRGB or AdobeRGB color space. It is just 60% of AdobeRGB. This criterion is important for graphic designers who need to see colors exactly as defined. No contender is better in this field, and they are sooner worse (40% of AdobeRGB are common). We took a detailed look at the TFT qualities with the photospectrometer. The DeltaE that describes the color accuracy was 4.6 in the grayscale. There were barely any shifts in color saturation, which is unusual. ColorChecker thus recorded a low DeltaE of 3.35. The ideal state is virtually achieved in terms of color accuracy. 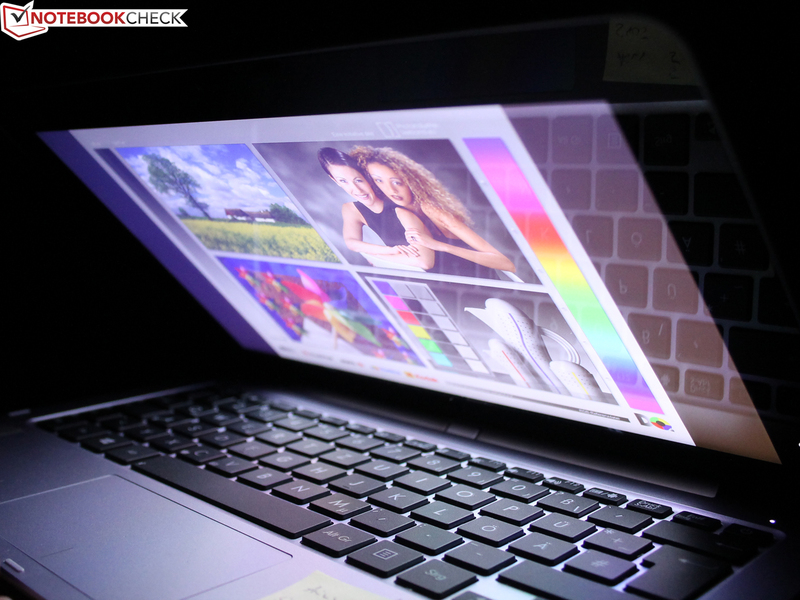 The human eye cannot see any differences between sRGB color cards and colors on the screen at a rate of below three. Outdoor use is well possible owing to the stable brightness (battery mode). Only the reflections on the reflective screen are distracting. The brightness sensor is located beside the webcam. It automatically adjusts the brightness according to the ambient light. 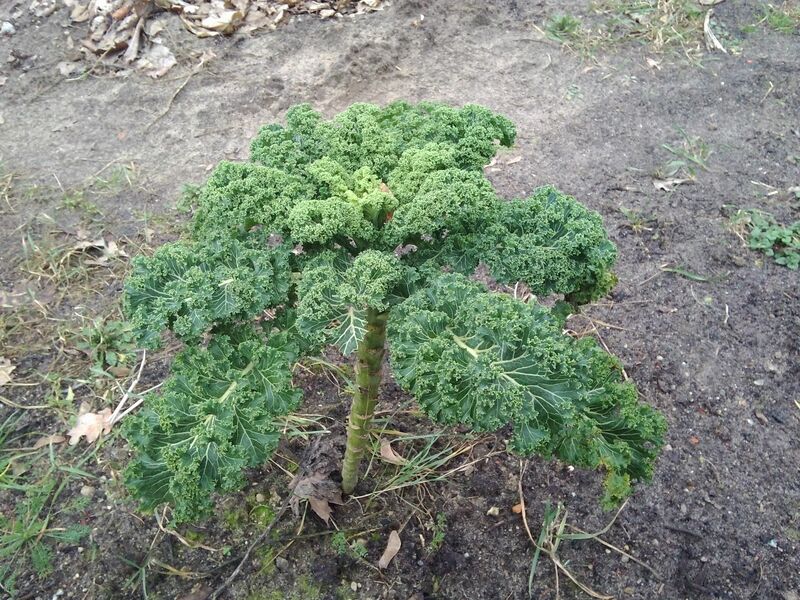 We disabled the sensor for our outdoor pictures. ... an overall good view sets in. 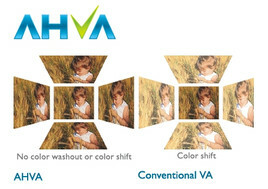 The AHVA (advanced hyper-viewing angle) is to ensure wide viewing angles. Color shifts did not occur. Our eyes could move right, left, up, and down. However, the contenders featuring an IPS screen also offer this. 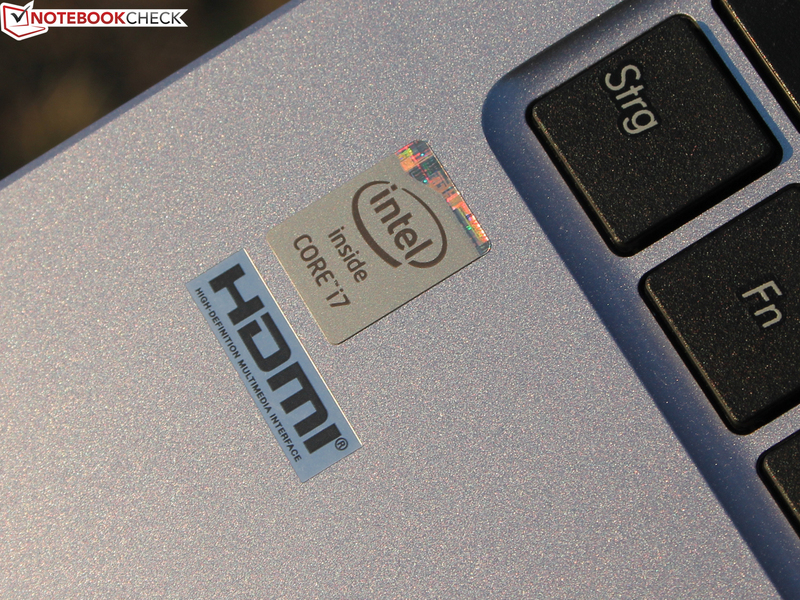 Intel's Core i7 4500U features two cores with a clock rate of 1.8 to 3.0 GHz (TDP: 15 watts). 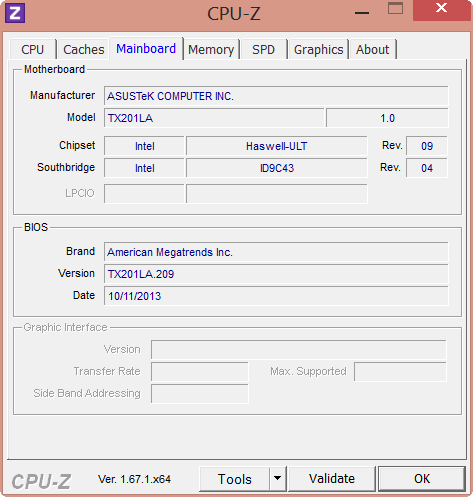 The Haswell CPU supports both Hyper Threading and the new AVX2 extension. Details about this and other features can be read in our database. Asus only offers this CPU, and the lower priced i5 4200U (the Trio's price is then just under 1000 Euros). Remarkable: This i7 is also used in Dell's 17 inch Inspiron 7737. Can this compact casing deal with that with regards to cooling? We will find out in Emissions. The processor-integrated HD Graphics 4400 accelerates the graphics. It can render current games in low settings and resolutions (not FHD), providing there is no throttling. The memory capacity is 4 GB of RAM (2 x 4 GB) that operates in dual-channel mode. A 500 Hitachi Travelstar Z5K500 hard drive is installed. 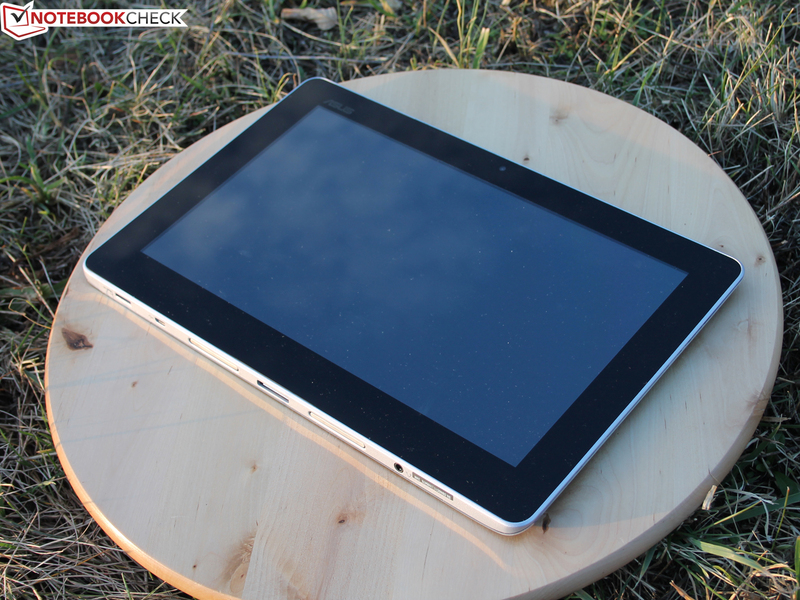 The tablet is powered by Intel's Atom Z2560, which is a Cloverview platform that Baytrail M replaced in late 2013. 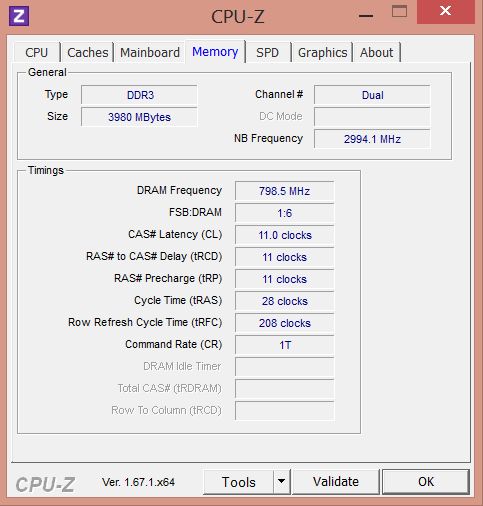 The dual-core clocks with 1.6 GHz (no Turbo), and was Intel's response to ARM and Tegra tablet SoCs in early 2012. Android is on a small 16 GB eMMC, which Windows can also access (10.9 GB free). The GPU is an Intel SGX544 as integrated in this Atom. Then there is also 2 GB of dedicated main memory for the tablet. A strong i7 CPU in a small casing? This always causes to doubtful glances because CPU throttling would not lead to noticeable performance losses for the first time. 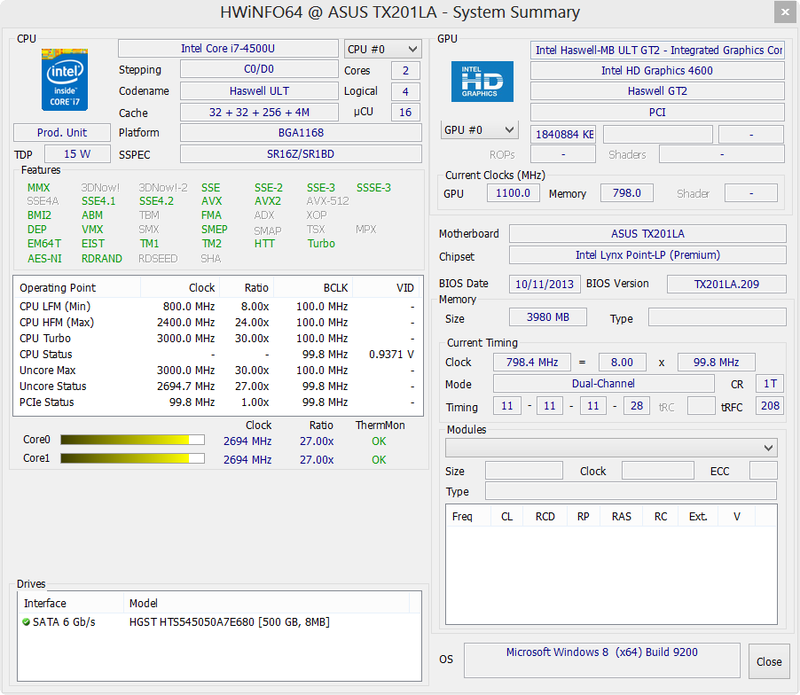 However, this is not the case in the Transformer Trio; the i7 always clocked with 2.7 GHz in both multi and single-core load. That is very close to the Turbo specification of 3.0 GHz. The benchmark scores are correspondingly high, and deliver the performance that this CPU should. 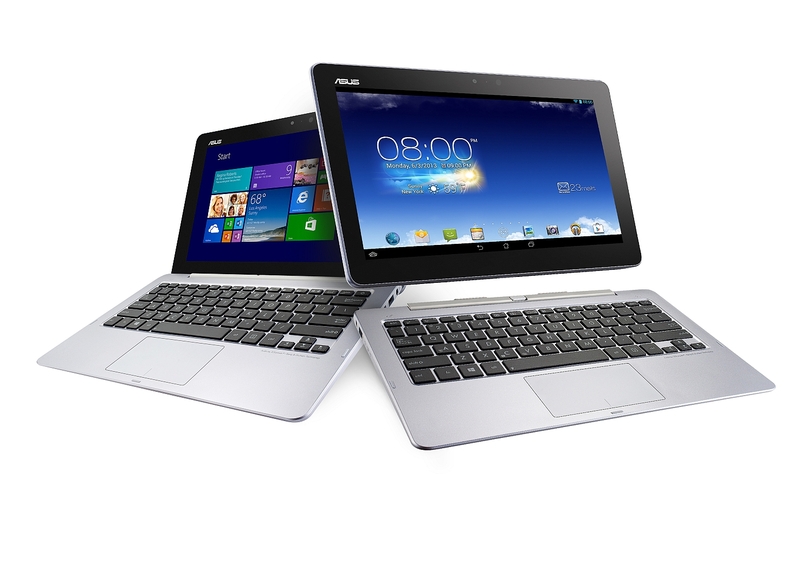 Consequently, it can slightly outperform its contenders, except for the Taichi 21 that also sports an i7 (Ivy Bridge). 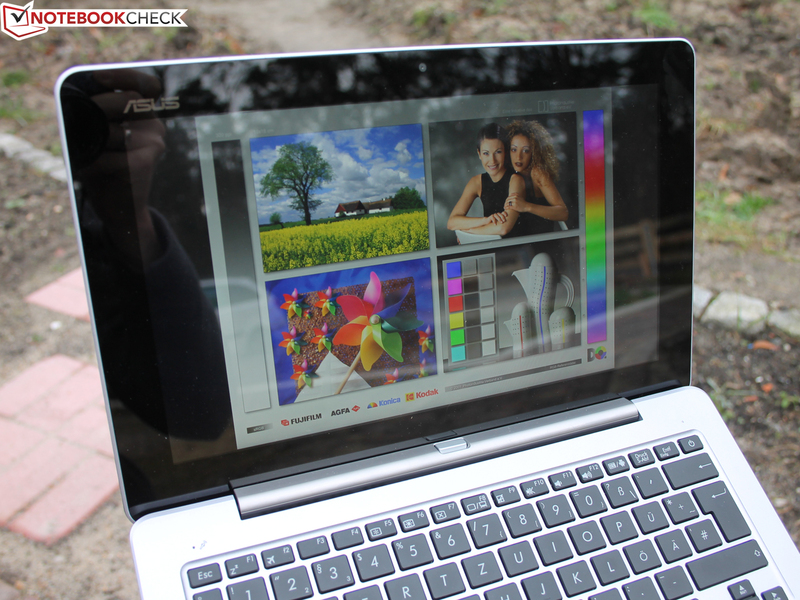 The Duo 11 is also available with a Core i7. We added the 32 bit rates of the older Cinebench R10 to again see the new Baytrail Atom in comparison. Our Transformer Trio can outperform this platform by 61%. The processing power is stably high in battery mode. The Multi and OpenGL test of Cinebench R11.5 finished with an identical score. The slow-spinning hard drive affects the application performance. Opening programs or system booting are performed much faster with an SSD. This is true for standard SSD formats, like mSATA or 2.5 inch SATA. 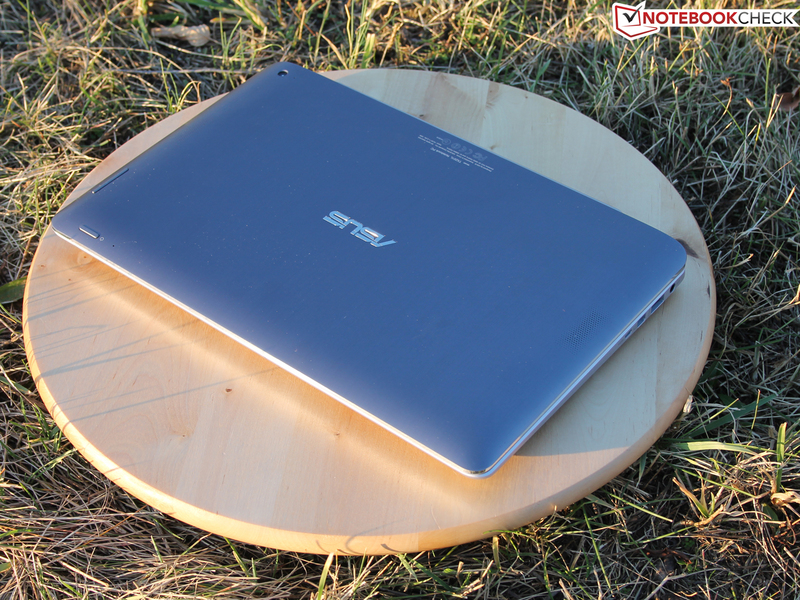 Asus' Transformer Book T100TA, as a low-budget model, is an exception in the chart; it only sports one eMMC. The XPS 12 and Duo 11 consequently take a clear lead with their SanDisk and LiteOn SSDs, although their computing power is not superior, but slightly inferior as shown above. 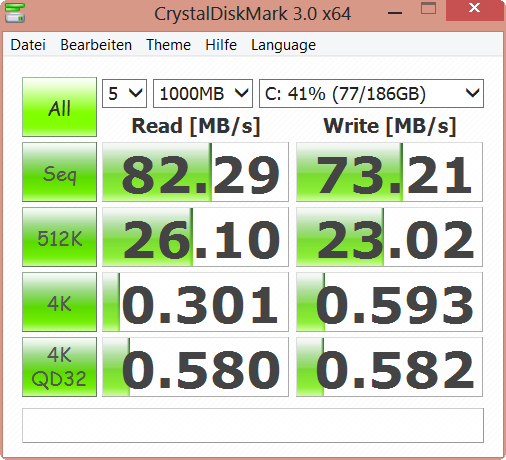 Hitachi's hard drive scores much worse than its SSD-based contenders in PCMark 7 - System Storage. This is only natural and has to be accepted in favor of a 500 GB storage capacity. We find the reason for the insufficiency of HDDs in the details: reading or writing small, random file blocks is performed extremely slow. 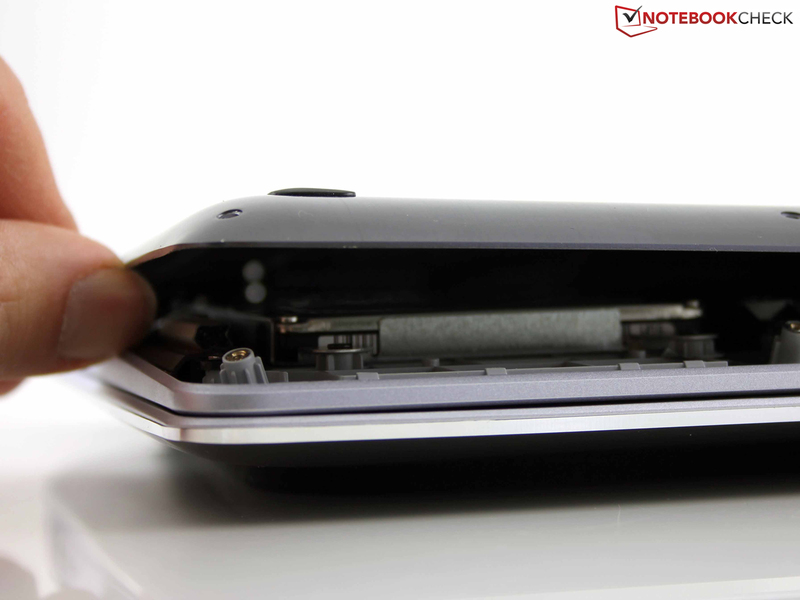 Even the weak eMMC in the Transformer Book T100TA is 3300 and 580% faster (read/write). The benchmark tools could not access the eMMC storage, and thus we cannot provide any rates for it. 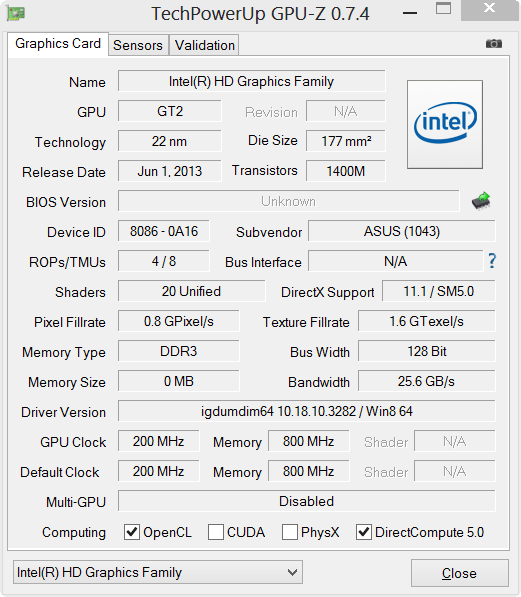 In addition to the HD 4600 (standard voltage), the HD 4400 is the most used GPU of the Haswell platform. It can clock between 200 and 1000 MHz via its Turbo. It also does this, and sometimes even outperforms the HD 5000 (i7 4650U) in the GPU benchmarks. 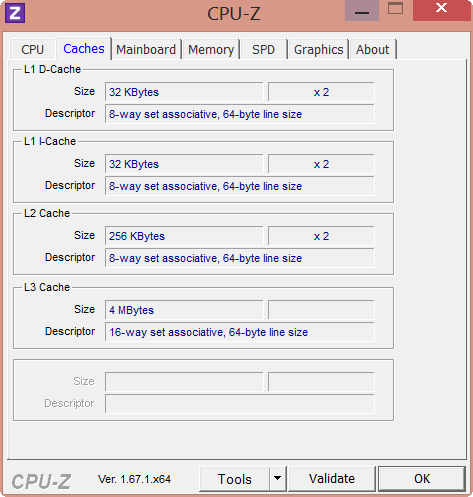 An HD 4000 is occasionally considerably slower, particularly in the Y CPU versions (HP's Split X2). Games are allowed on the Trio, but the user will have to get used to low settings, and absolutely not enable Full HD or antialiasing. Rather undemanding tracks, such as Fifa 14, can be played even in the native resolution. Low settings will be preferred in most cases. A list of all games tested on the HD 4400 can be found in the GPU's data sheet. Asus avoids the problem of squeezing cooling-needy hardware in a slim tablet chassis by using the Haswell platform in the dock. The Atom processor in the Android part can be cooled passively; the aluminum bezel is perfect for that. Consequently, the tablet is absolutely silent. Unlike the Haswell processor that needs a lot of support from the active fan in the keyboard's base. The vents are invisible at first glance; they are well hidden underneath the one-piece hinge. The fan is usually never inactive, but we nevertheless only measured a minimum of 30.6 dB(A), which is barely audible. The cooling speeds up strongly during load, where we measured 39 and 40 dB(A). Thus, the noise level is pretty much the same regardless whether 3DMark 2006 (39 dB(A)), or our (unrealistic) full load stress test demands the Trio. Both contenders reach a similar level in load and idle. We recorded an average temperature difference of only two degrees Celsius on the upper side and four degrees Celsius on the underside in both load states (graph). The surface temperatures in a few areas, in particular the wrist rest and parts of the keyboard, do not at all differ in load and idle. The graph shows two hot spots in the processor's vicinity. However, 41 degrees Celsius are not critical here either. 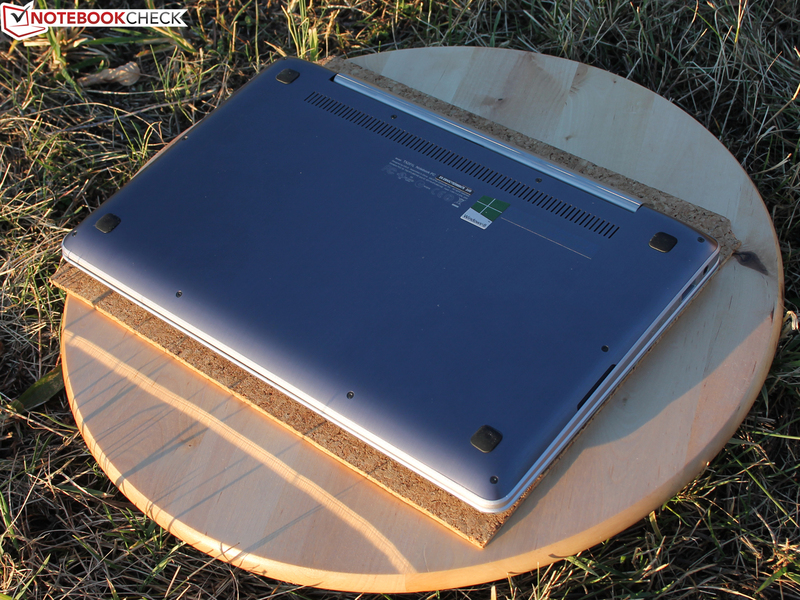 The Transformer Book Trio TX201LA did not do as well in the stress test as in the simple CPU benchmarks. 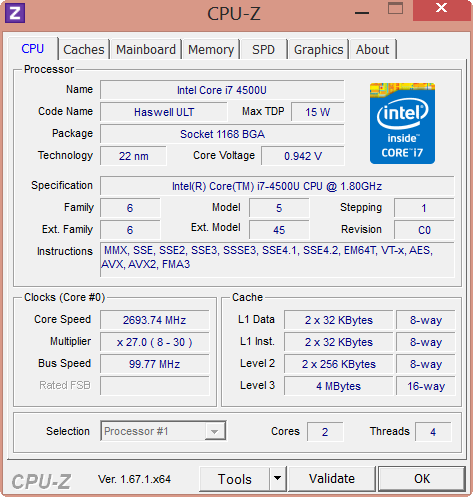 The clock speed dropped to 1.2 to 1.3 GHz after only one minute. The reason: Our stress test not only loads the CPU to 100%, but also the HD 4400. The latter's speed increases to 800 MHz, and remains stable. Throttling curbs the waste heat production, which keeps the processor at consistent 66°C. The thermal load does not have an impact; as soon as the GPU load stops, the CPU's clock skyrockets to 2.4 to 2.5 GHz, which is clearly above the Turbo range. The score of the 3DMark 2006 performed directly after the stress test was the same as after a cold start. B&O ICEpower Audio System sounds promising, but how much of that is available in real-life use? The tablet and PC station both have two speakers. However, they do not work simultaneously. Windows only uses the speakers in the base unit, which achieve a high volume but tend to scratch at that level. Maxx Volume in the MaxxAudio sound control should therefore be disabled. The small speakers on the base unit's lower sides cannot reproduce bass. The mid-heavy sound is only suitable for undemanding music enjoyment. Audiophiles will not get around using headphones or external speakers. 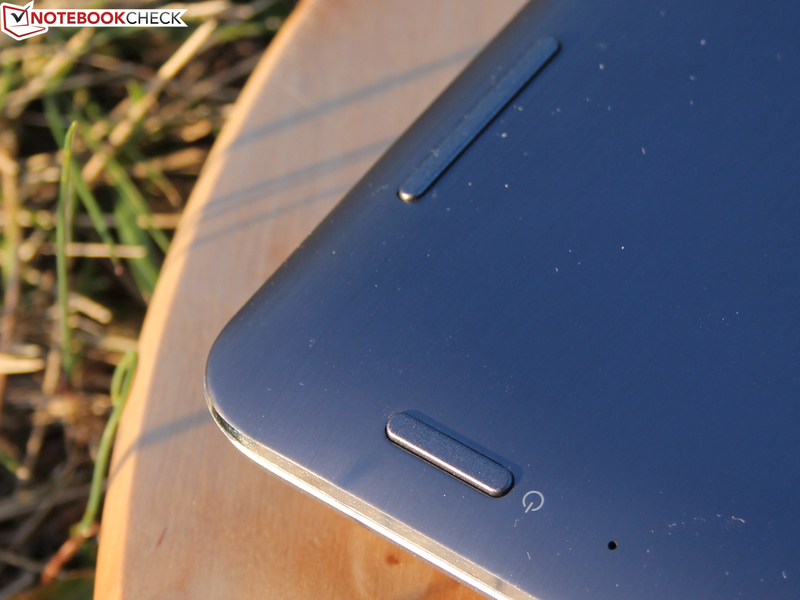 The tablet's speakers are located on the back. They make a somewhat better sound impression because they do not scratch in maximum volume, and we even believed that we heard a hint of bass. They also have the undisputed advantage that the sound is not directed toward the tabletop, but in the room. The power consumption is very similar with the comparison models, at least in idle. The system consumes six to eight watts in idle with a full battery (minimum and maximum). The consumption skyrockets in load with 30 watts, which is however not as high as Ivy Bridge CPUs. The Vaio Duo 11 needs 40 watts, and the Taichi 21 36.5 watts. It takes three hours for the 45 watt power supply to recharge both completely drained batteries. That is very fast for 52 watt hours. Asus cannot quite keep up with the good runtimes of the Windows contenders. The practical Wi-Fi test (brightness: 150 cd/m²) stopped after 4:51 hours. Here, websites are opened every 45 seconds via a script. 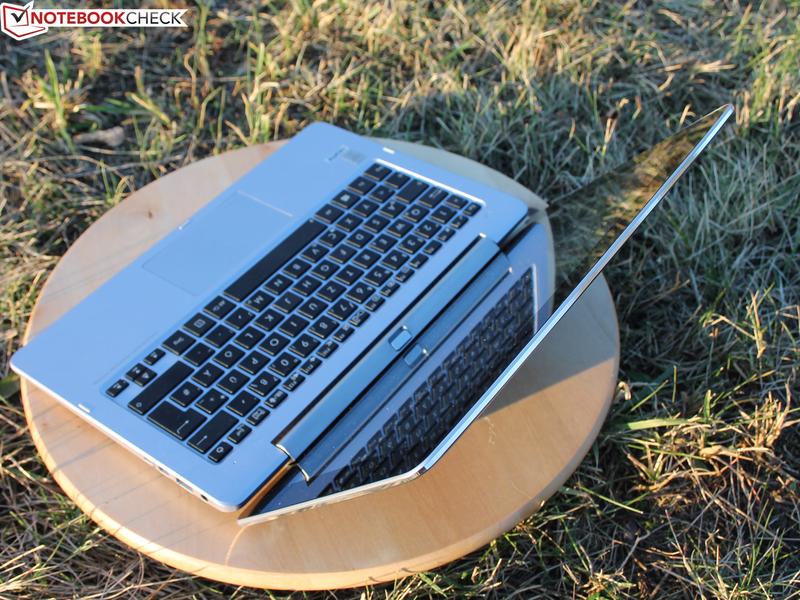 Dell's XPS 12 (Haswell) runs 59% longer, but Sony's Vaio Duo 11 shuts down 22% sooner. The video playback runtime of five hours (Big Buck Bunny H.264 1080p) is virtually identical with the Wi-Fi test using the same brightness. The wireless modules and the Android system (background) are disabled. The Wi-Fi test with only the tablet finished after 10:25 hours (625 minutes). This again makes the runtime differences between Windows (ultrabook hardware; 52 Wh), and Android (tablet platform; 19 Wh) clear. The PC station can use both its own 33 Wh battery and that of the tablet. 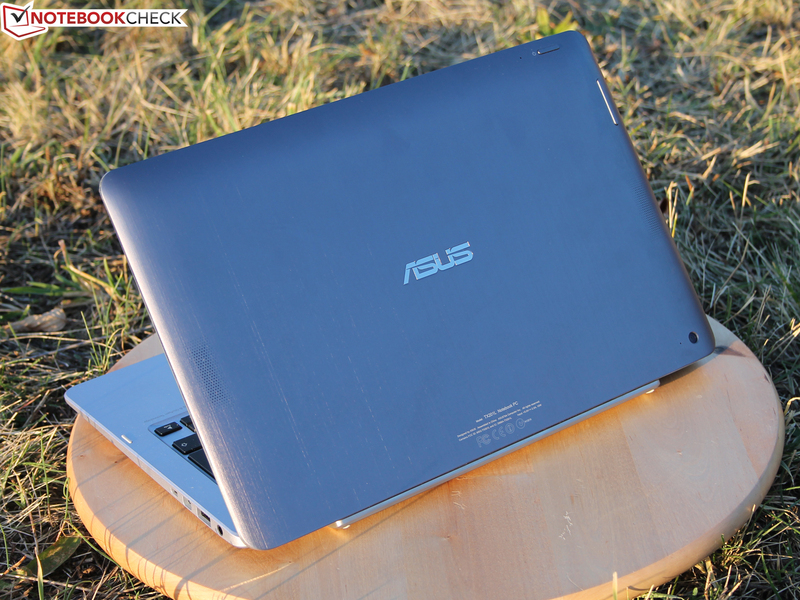 Does Asus have the all-rounder in its product line with the Transformer Book Trio TX210LA? It is in fact a very appealing idea: Users do not need an extra Android device because their portable Internet tablet is part of the PC. Simply detach it and go - little brother can continue work with the external TFT in the meantime. Many users own both a Windows laptop and an Android tablet nowadays. Data sharing between the operating systems can get bit awkward for inexperienced users. The Trio moves both worlds so close together that we barely have to think about how to access pictures from the Android camera even without Cloud storage. Asus phrases it in advertising message this way: Windows for the serious workday, and Android for fun and games afterwards. However, the Trio might be suitable even for users who do not take the tablet to the nightclub. The Trio offers conservative Windows users who decline using Windows via touch a work laptop, and they will likely only use the Android tablet for videos in bed or slideshows at the family reunion. The possibilities for personal use are exceptionally vast. And exactly this is the advantage of the Transformer Book Trio. 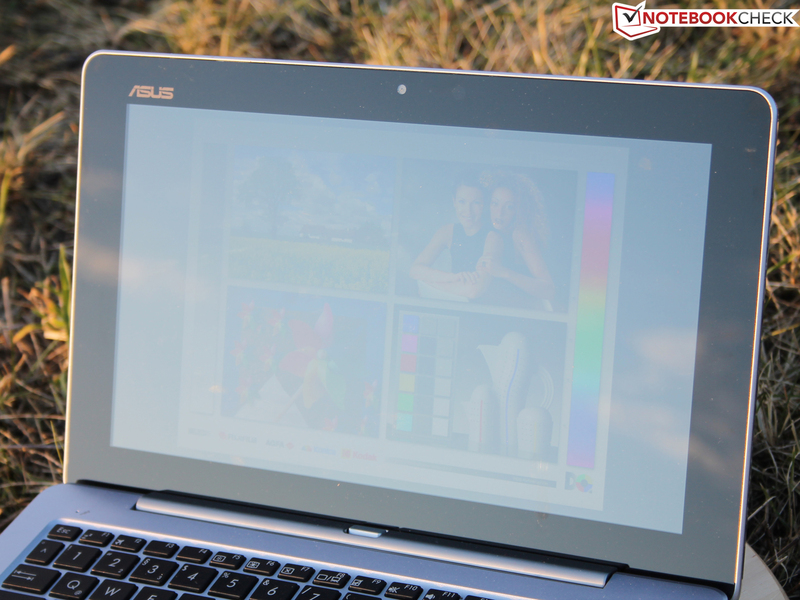 Asus relies on a very good screen, an extremely solid and quality casing, and Haswell components that unfolds its full power in routine use. The battery runtimes are not quite top-notch, but then there is the Android Trio with its 10 hours (Wi-Fi test). The ports (DisplayPort, VGA, USB 3.0, HDMI) are not only acceptable for modern workaholics, and gigabit Wi-Fi makes us fit for the future. Beyond the application scenarios, we are facing a sophisticated piece of high-tech that pulls even with the most expensive contenders. Dell's XPS 12 (1300 Euros) is suitable when Android is absolutely unnecessary, and Windows is to be used exhaustively via touch. The same is true for the Vaio Duo 11, where the Core i3 3217U version already costs 1000 Euros. 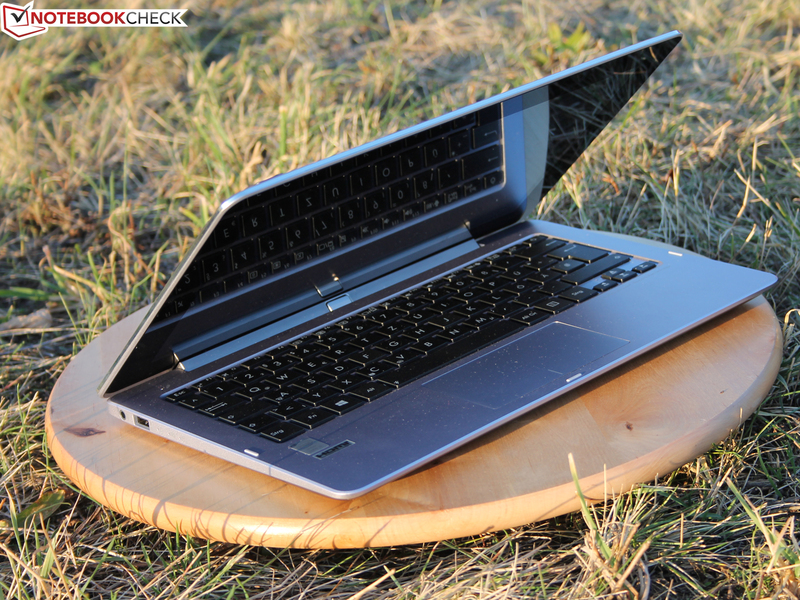 The Transformer Book Trio is cheaper; just under 1000 Euros are demanded for the Core i5 version. There are now many convertible subnotebooks. ... including a 500 GB hard drive. The tablet can be used without the base via Android 4.2 on a 16 GB eMMC. The construction seems well thought-out; the guide holes for the lock close. 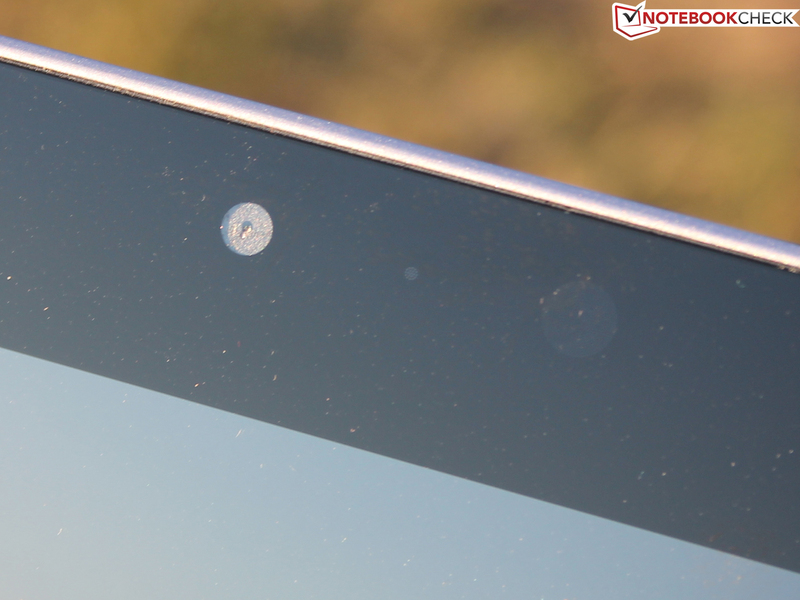 The solid metal hinge lets the tablet wobble clearly. ... can only be unlocked via a mechanical button. The tablet can be detached or inserted at all times. The Windows user can continue work on an external monitor (HDMI, DisplayPort). 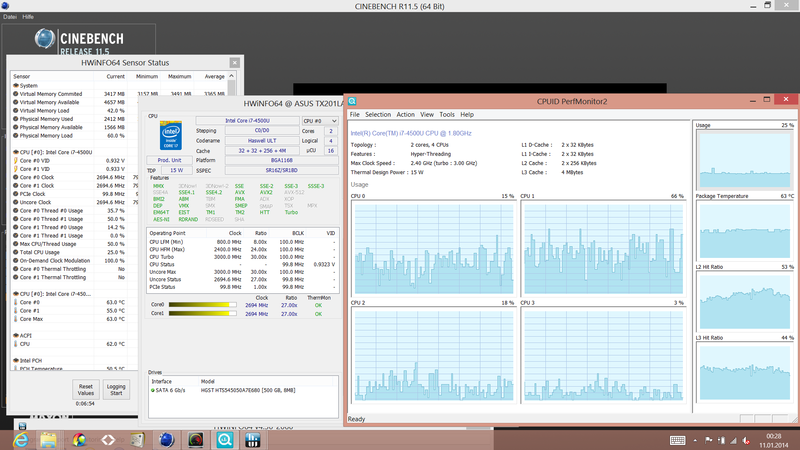 The spinning hard drive slows down Windows operation a bit. 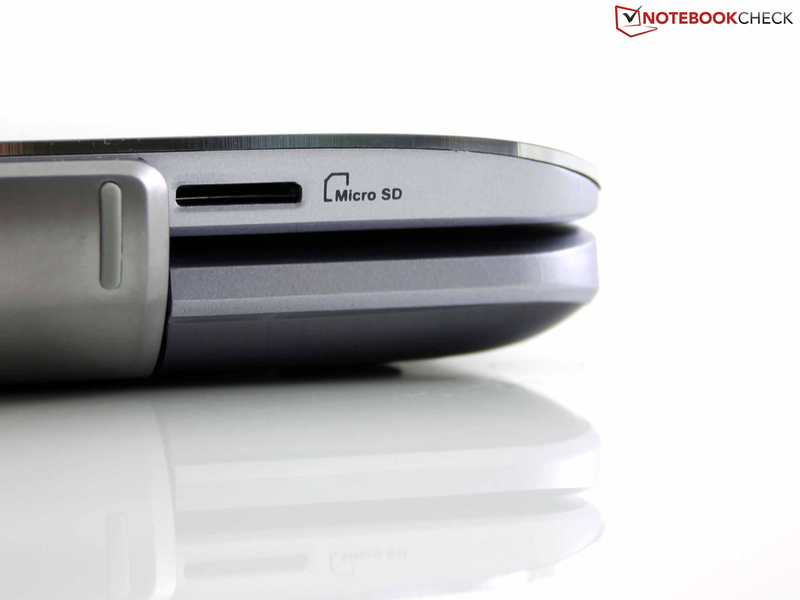 The tablet has its own interfaces (Micro USB, microSD); the card reader can also be used under Windows in docking mode. Windows is turned on via the keyboard, and Android via the power button on the back. The convertible sports four speakers - two in the tablet and two in the base. The ambient light sensor is beside the front-facing webcam. The sensor sometimes works quite frantically, and annoyed us with flickering background light. The screen achieved 360 cd/m² at full brightness in daylight. Distracting reflections are then the only thing that ruins the perfect view. In the dark: The wide viewing angles, and high contrast are appropriate for the price range. The primary camera is on the tablet's lower right. That ensures a steadier use under Windows. The power supply provides 40 watts. We measured a maximum of 34 watts during normal load. There is no explanation why the power supply has a high-gloss finish. 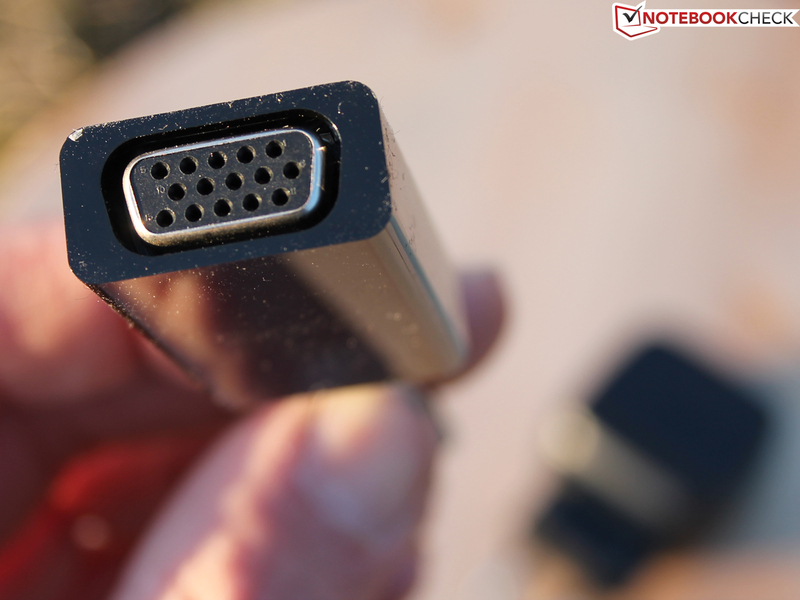 Accessories: Great - a mini DisplayPort-to-VGA d-sub adapter is included. ... alongside the micro-USB cord. ... the plate does not open. We gave up at this point out of consideration for the loaner. The screen looks good in daylight; the high brightness is maintained even in battery mode. The hinge's mechanism makes a solid impression and should survive rough routine. The versatility. We can somehow imagine the Trio in every life-situation of a tech-savvy person. 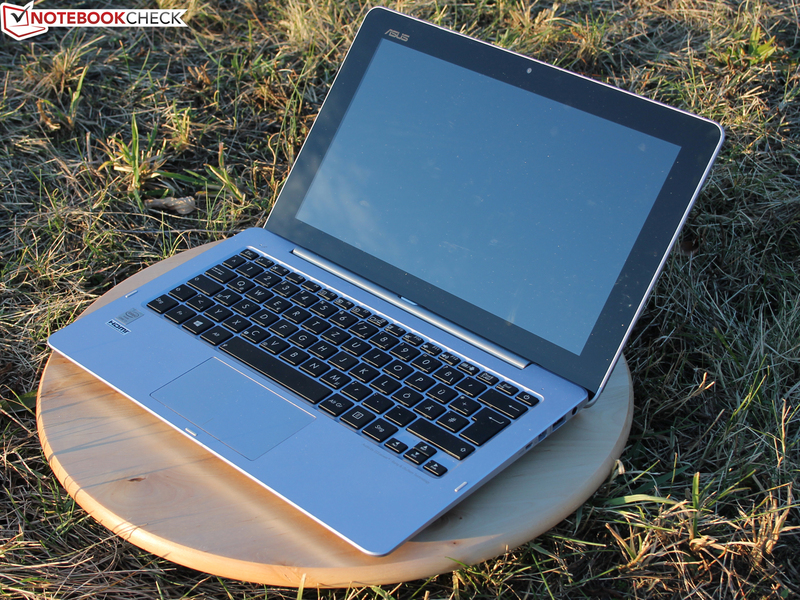 The unibody casing of tablet and dock seamlessly fits to the quality impression of the keyboard. 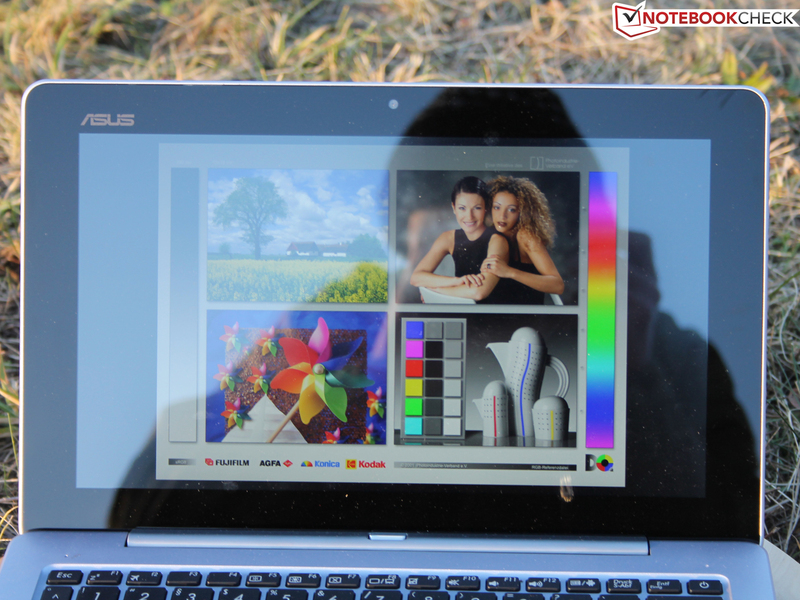 The color-rich screen, the adequate performance (HDD), and the interfaces complete the picture. Well, we can't think of anything here. 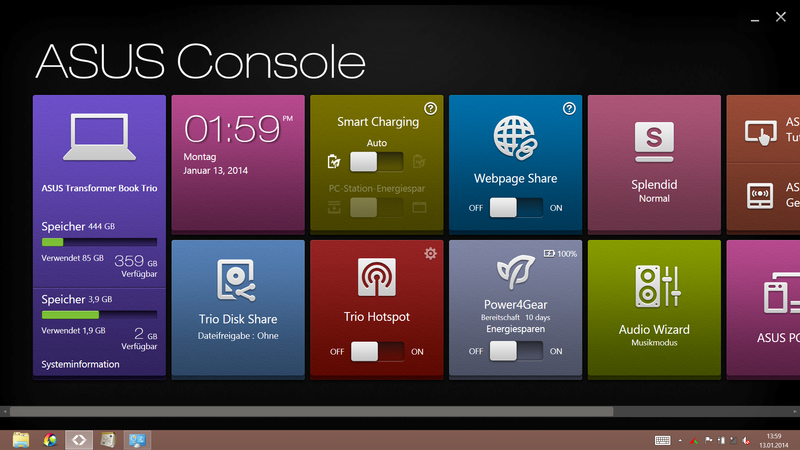 The Asus Console provides a few special battery settings; the tablet's battery can be prioritized.